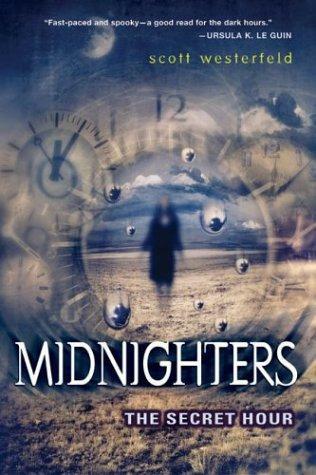 midnighters is about 5 teens who where born at midnight & live in Bixby, Oklahoma. why is this important? its because every night at exactly midnight for those who where born at midnight, that live in or near bixby, the 13th hour of the day is reveiled to them, aka the secret hour, & they call themselves midnighters. during the secret hour, all time stops for 1 exact hour & as such, so dose all technology. the number 13 & 12 plays a major rule in this series as steel(and other forms of metal) objects with 13 letter name provide protection against the creatures that lurk in the secret hour for the midnighters, but the number 12 enhances the powers of Darklings and Slithers, the creatures of the secret hour. bixby was pretty much built to protect its inhabitants against Darklings and Slithers, as there is a 13 pointed star throughout bixby, Oklahoma. also bixby(5 letters), Oklahoma(8 letters) has 13 letters in its very name. each of these 5 teens has a unique power(some that can only be used during the secret hour) & each type of power has a different symbol (big picture above).the first book focus around Jessica day, the newest midnighter & how she adjusts to not only bixby, but also bixby's first dark secret as her & the rest of the midnighters try & find out what her power is. then the series starts to pick up the pace, in touching darkness as darker secrets about the past of bixby starts to emerge, & lastly in blue noon, things get even more darker, exciting, & ectera, ectera. you get the picture. so how many of you have read this series & what do you think of it? ^ I've read that series. I liked it. I love Scott Westerfeld's work, especially the Uglies series. His work is fantastic!